Luca Pacioli was a Italian renaissance mathematician, born in 1445 in Sansepulcro, Tuscany. He greatly influenced the world he lived in with his manuscripts also affecting the modern life mechanisms. He received his education in the local language instead of Latin, focusing mainly on business knowledge although his interest was more focused on mathematics. 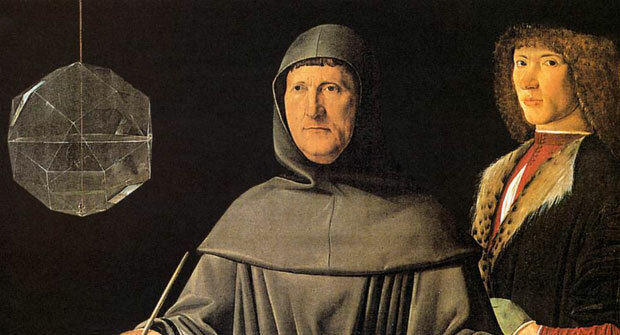 After moving to Venice in 1464, Pacioli taught himself more business tactics, along with tutoring sons of a merchant. It was during this period when he wrote his first arithmetic treatise. Pacioli was a Franciscan friar from 1472 till 1475. Pacioli started teaching at the University of Perugia after which he got the chair of mathematics in 1477. In 1489, he moved to his home town, Sansepolcro. His stay here was not easy. There was a rift between Pacioli and some men from the religious order due to some freedoms that he had been given by the pope. It was so much that he was banned from teaching there in 1491 however the jealousy lessened somehow by 1493 and Pacioli was also offered to give sermons at Lent. His first textbook, ‘Summa de Artihmetica, Geometrica, proportioni et propotionalita’ (Everything about Arithmetic, Geometry and Proportion) was printed in 1494 in Venice. While he was teaching at Zara (modern day Croatia), he wrote another textbook on arithmetic. Pacioli taught at various universities including University of Naples and University of Rome. He also taught mathematics to Leonardo de Vinci. After Venice, Pacioli moved to Florence where he started teaching geometry at the University of Pisa in 1500.He was also involved in the church’s affair during this time and in 1506, he was made the superior of the Order of Romagna. In 1509, Pacioli published another one of his works which was in three volumes named ‘Divina Proportione’. He also translated Euclid’s work ‘Elements’ in the Latin language. Pacioli spent most of his life in travels, going to a place and teaching there for some time and then moving on. He went to Perugia once again in 1510 where he lectured for a while and then travelled to Rome to do the same. His work ‘De viribus quantitatis’ was based on mathematics and magic. It taught everything there was about card tricks, eating fire and coin dancing. This book did not get published till 2007 after it was discovered by David Singmaster, another mathematician. His treatise called ‘De Ludo Scacchorum, meaning ‘The Game of Chess’ was thought to be lost but a manuscript was found in 2006 in the library ‘Count Guglielmo Coronini’ and was published in Pacioli’s home town in 2008. Pacioli was the initiator of the double entry accounting system which is almost the same as the accounting system used nowadays. He introduced the use of ledgers, journals and bookkeeping. He was the first person to have used a balance sheet and income statement. His bookkeeping chapters known as ‘De Computis et Scripturis’ (Of Reckonings and Writings) now known as ‘The method of Venice’ entirely changed the way accounting was seen and used. Pacioli continued to lecture at various academic institutions till his death in 1517.